I’ve never met a child who wasn’t interested in animals! 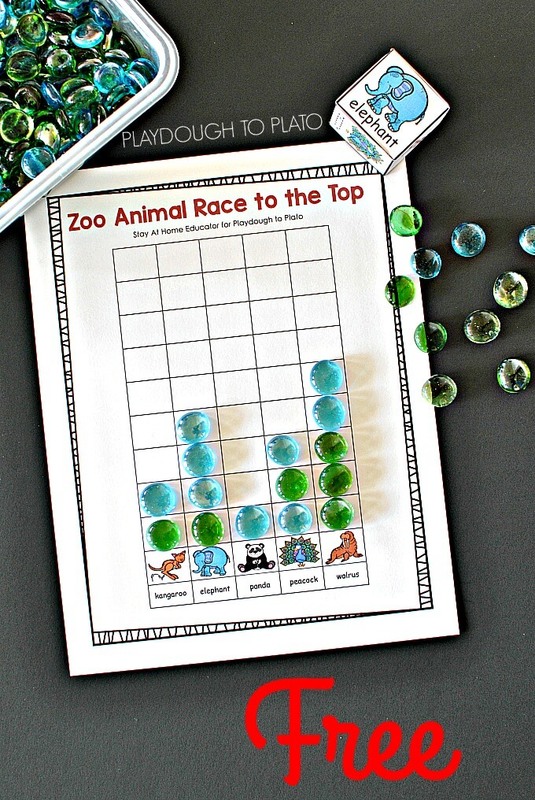 Whether you’re looking for a fun follow up to a zoo field trip, or you need a motivating way to reinforce counting and graphing, kids will love this playful zoo animal race to the top game! To prep for the game, I printed the free zoo animal game (found at the end of this post) on cardstock to give it extra durability and laminated the game board so it could hold up to plenty of reuse. I cut out the die, folded it into a cube and glued together the tabs so it would stay in place. 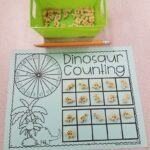 Then I grabbed a handful of math counters. We had glass stones on hand but you could use foam animal stickers, beans, buttons… so many things! The concept was simple! Kids rolled the animal die and named the zoo animal. 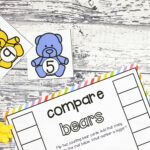 Then, they added a marker to the corresponding animal column on the printable. First, children played individually, competing among themselves to see which animal climbed to the top first. 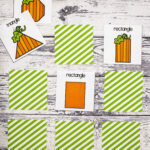 Once they had the hang of it, we tried a second version of the game. 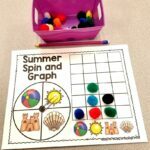 Each child had their own graph and die. They rolled their dice at the same time and added the corresponding counter to their graph. The first player to reach the top was the winner! The die has a “free” space. When kids rolled a “free”, they chose where to add their counter. 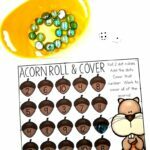 There was serious strategy involved – some children liked giving one animal a strong lead and others, including my daughter, gave the extra token to the animal with the fewest gems. 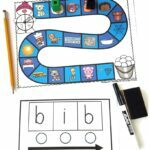 I love games like this one because they are a great way to introduce children to the most basic concepts of graphing and measurement. 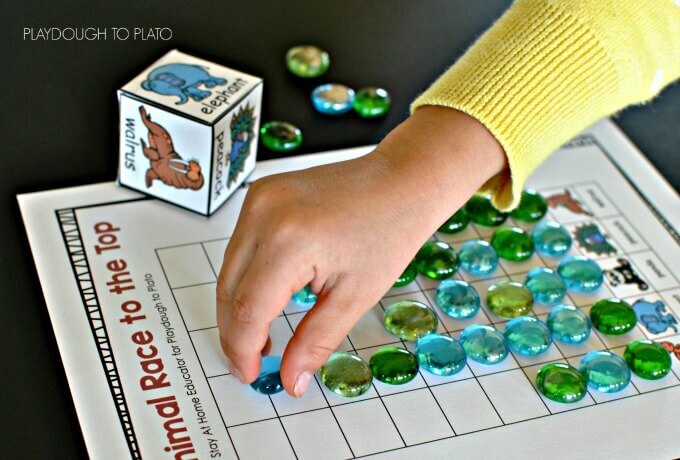 While the spaces on the “graph” are not numbered, organizing data (the dice rolls) into a chart like this one teaches children concepts in sorting and classifying, as well as greater and lesser quantities. 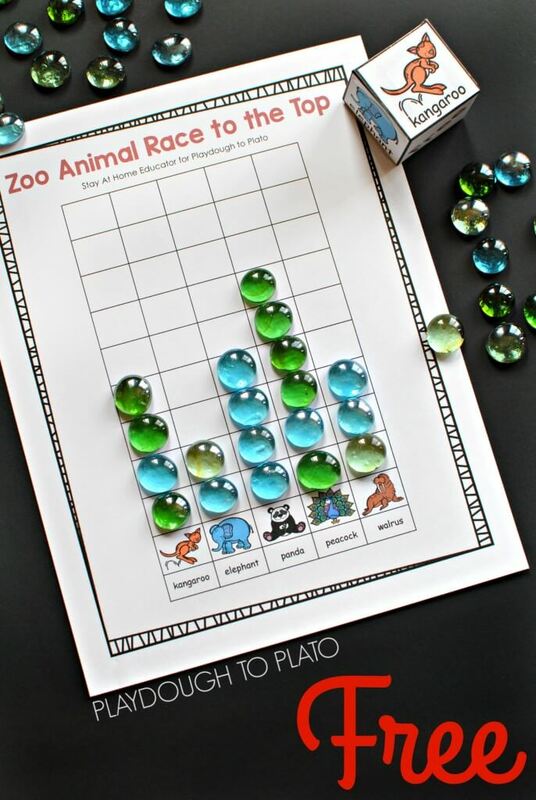 Will the zoo animal game fit nicely into your preschool or kindergarten theme?! 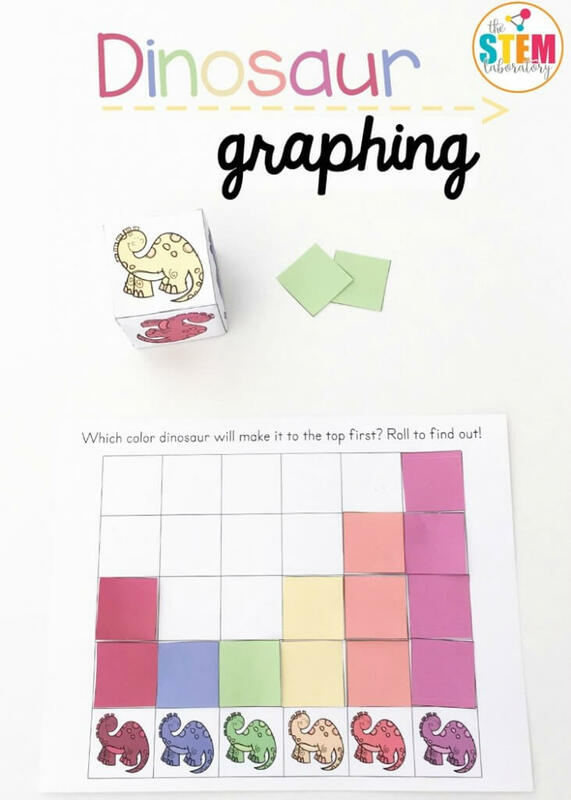 Click the blue button below to download your free copy and then hop over and snag a Dinosaur Math Graph too!